Few developments shout stability and permanence quite as loudly as the establishment of a university. There is something about those green-covered campus lawns growing in a water-starved desert land interspersed with eager young students hurrying to class, that stirs pride in the hearts of citizens of an expanding city. A settler body voted Tuesday to grant university status to Israel’s only West Bank settlement college, overruling objections by Israel’s Council on Higher Education and potentially stirring a new round of international condemnation against Israeli policies in the West Bank. Upgrading the college in the Ariel settlement has touched off a debate inside Israel, where Prime Minister Benjamin Netanyahu’s government has been driving a string of pro-settler measures — including a state panel’s recent conclusion that Israeli settlement of the West Bank is legal. Let the international condemnations rain down. And pay no heed to that debate inside Israel. What matters to Ariel and the politically potent settler movement, is that Israel has firmly planted its first “Samaria” University on Palestinian soil. Most of the world views the areas that Israel conquered from Jordan in the 1967 war, and where the Palestinians want to establish a future state, as occupied territory, and the Israeli settlements there as a violation of international law. To those who do not ascribe to the Zionist narrative as the only true version of history, “the areas that Israel conquered from Jordan” is, in fact, not the biblical land of Samaria. It is called the Palestinian West Bank of the River Jordan. Critics denounced the decision as a political move aimed at bolstering the settlement project. The presidents of Israel’s seven other universities and other state bodies opposed the upgrade, saying that the competition for limited budgets and resources was already severe. The Ariel University of Samaria’s new status will entitle it to more state funding, and some see the move as designed to strengthen Israel’s stake in the West Bank, territory it captured along with the Gaza Strip and East Jerusalem in 1967. The university can use the government funding. Founded in 1982, the school now has 13,000 students. Currently, around 311,000 Israeli settlers and 2.5 million Palestinians live in the West Bank. Speaking for domestic consumption, the modern state of Israel has long referred to the West Bank and Gaza as Judea and Samaria, employing a biblical literalism to justify a modern colonial military invasion of Palestine. Using biblical literalism to describe modern state borders is a neat linguistic trick that appeals to Israel’s right-wing expansionists and land developers. In this reading of the scriptures, Yahweh becomes a property manager who dispenses land titles. Changing indigenous names is a long-established strategy employed by invading powers. One of the first things the British army did in dealing with Northern Ireland was rename its streets, dropping the Gallic designation for proper English terms. I encountered this “name changing to fit the narrative” strategy during the First Intifada when a group of us crossed over into Israel from Palestine to visit a government center for the instruction of new citizens. During a break, I asked an Israeli official about the recent unrest in the West Bank. Leumi Bank is based in Israel, with banking branches world wide, including one in Chicago. Smart fellow; he must have known I was from Chicago. On another visit to Israel, which preceded the First Intifada, an Israeli Foreign Ministry official told his U.S. media visitors we should be “paying attention” to the positive influence of “this Hamas group” in Gaza. At the time, the Palestinian Liberation Organization (PLO), headed by Yasir Arafat, was considered Israel’s “enemy”. Hamas, on the other hand, was Israel’s newly-minted “friend”, a social service organization that cared for the poor. Ironically, the First Intifada, which ran from 1987 to 1993, began in the Jabalia refugee camp in Gaza. The Zionist narrative shifts, as needed, to serve the Israeli expansion plan, relying, at times, on the Arab proverb, “the enemy of my enemy is my friend”. With the official establishment of Israel’s first university in Samaria, that expansion plan has attained its long-sought standing of respectability and permanence. The final step, since it is a settler project, should be easy. The Israeli Defense Force remains as the final authority over all West Bank affairs. The IDF will need to give its final seal of approval. Israel’s style is to pay no attention to what “most of the world” thinks, other than to stir American religious guilt with allegations that Israel is being constantly demonized through “anti-semitic” church resolutions. 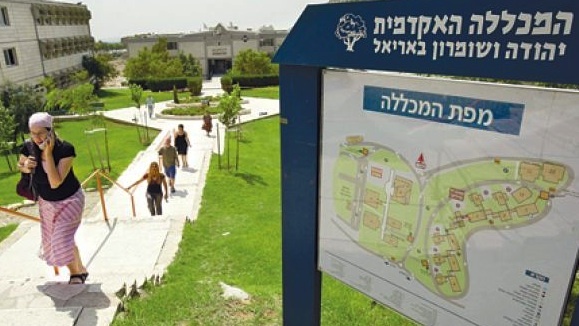 The promotion of Ariel Institute to the status of a university in Samaria is the end of a long Israeli development process, which proceeded along an expansionist track while the “peace process” game traveled a second, entirely unrelated, subterfuge track. We know where the subterfuge track traveled; it got extensive media coverage. Here are highlights of the expansionist track. Anyone who understands the geography of the Land of Israel knows how important Ariel is. The settlement enterprise here is the heart of our land. Here is where our forefathers dwelled and here is where we will stay and build. We want to strengthen the peace and co-existence with our neighbors but this will not stop us from continuing with our lives here, where we’ll continue to plant trees and to build. Ariel, the capital of Samaria [the northern West Bank], will be an integral, inseparable part of the state of Israel in any future arrangement. Ariel was created as a settlement near Jerusalem. After a few years of growth, it was surrounded by the “security wall”, which has nothing to do with security and everything to do with land theft. The city grew, its citizens housed in modern red-roofed structures, so colored, it is rumored, to serve as a marker for Israeli military aircraft in future wars. During the summer of 2011, the Israeli government, which had refused even to consider President Obama’s 2009 request for a settlement building halt, approved another 277 housing units for Ariel. This growing city needed its swimming pools and its shopping malls. Their garbage disposal, however, was not a problem. Settlers in Ariel send their garbage down hill toward surrounding villages, where it pollutes Palestinian water supplies and fouls their fields. Ariel was designed to expand. Educational institutions grew rapidly, culminating in the final approval of Israel’s first university within the West Bank. International travel plans for Mitt Romney, the Republican presumptive nominee for the U.S. presidential November election, includes a stop in Israel, July 28-29, where he is expected to meet visit with Israeli Prime Minister Benjamin Netanyahu. In what should not have escaped Romney’s trip planners, a few days before Romney began his trip, the Israeli Attorney General Yehuda Weinstein asserted that the “Al-Asqa Mosque is part of Israeli territory”. This inflamatory assertion immediately drew “unprecedented condemnation from across the Islamic world.” Of course it did, and knowing just how far into the Zionist camp Romney has already moved, we will not hear the slightest complaint on this absurd anti-Islam Israeli statement from the Republican candidate. Obama’s mentor Abner Mikva, other Chicago friends, and several members of his new administration, such as Rahm Emanuel, had all emphasized the importance of persuading Israel to stop building new settlements in the occupied territories claimed by the Palestinians. once in the White House, Obama moved fairly quickly to put this idea in effect. As we have seen in the steady march of Ariel to university status, the settlements did not stop. Along the way, Netanyahu drew raves from the U.S. Congress and insulted any American diplomat who came his way. Now while Netanyahu pushes the U.S. toward war with Iran, five Israeli citizens riding a tourist bus are killed in Burgas, Bulgaria, by what appears to be a suicide bomb attack. Netanyahu’s response is to blame Iran.Tikun Olam has an early analysis, which urges caution in the blame game. Phillip Weiss reported Friday morning, July 20, that the White House was not yet prepared to point to any group as the responsible agent. Whoever was responsible, as long as the settler movement continues to control Israeli politics, there will be more horrors like the tourist bus deaths. Meanwhile, the grass grows on the new Ariel University campus and the Ariel city garbage continues to flow downhill and pollute Palestinian water and farm fields. Where do we find hope in this darkness? Good complete article. And thank you for opposing the threats against Iran. University indeed! Lawns, pools, etc. I think this is a time to ensure that the degrees from this school will not be honored by any graduate school in the real world. Thanks for an excellent revealing article, Jim. It is outrageous to note the dramatic contrast in how Apartheid Israel dealt with Fr. Elias Chacour, the Catholic Melkite Bishop of the Holy Land, and Nobel Prize candidate. Fr. Chacour, had a torturous experience in obtaining the necessary permits and approvals in order to build Mar Elias school in what is referred to as, Israel ‘Proper’, because the Israeli authorities held him back every step of the way. Just for trying to build a school? Fr. Chacour faced horrendous barriers and obstacles in getting approvals and permits to build a primary school, a highschool, and finally a university open to Christian and Muslim Arabs and Israeli Jews. The school premises and students are not in the Palestinian territories, but in the Galilee, in Northern Israel. This is absolutely despicable because the Israelis wanted Palestinian Arabs in Israel to seek out higher education OUTSIDE of Israel. In Israel’s warped colonial mind, they make it difficult for Palestinian students to return to their homeland and, subsequently, employ ethnic cleansing and Apartheid measures under a different guise. Meantime, Israeli settlers (Americans and Russian illegal immigrants) steal Palestinian lands and resources and get what they want from Mr. Netanyahu and the American taxpayers foot the bill. If only Americans would stop giving foreign aid to the rich country of Israel. That would go a long way to discouraging the settlement enterprise. We have an enormous deficit, but Congress continues borrowing in order to give $8 million a day to Israel to support its land grabbing, cruel occupation. Too bad Congress doesn’t work for American interests instead of Israel’s. Check out Elizabeth Warren’s web site. What you find there about Palestine/Israel is astounding. You have to hand it to the Israeli lobby. They are efficient. I’m confused. First the area “is, in fact, not the biblical land of Samaria”, then “Changing indigenous names is a long-established strategy employed by invading powers”. Given that the area is in fact the Biblical land of Samaria, is its indigenous name, your article is self-contradictory. Equally, when building a university is a terrible thing, almost as bad as building a hospital or kindergarten, it really is time to realise the total bankruptcy of your argument.